The Anglo-Saxon name for an October moon isn’t Falling Leaf Moon without reason; for the last few weeks I’ve been meaning to sweep my front path. Dylan will slip on those leaves, I’ve kept telling myself. Since Dylan started going to and from school on local authority transport at the age of five he has had the habit of hurtling at high speed into the house on his return. Without stopping to look or check for potential obstacles along the route he sprints like a German ICE or Japanese Bullet train to his destination. This habit has stayed with Dylan through 19 years of schooling and four different houses, three different schools and dozens of different drivers and escorts. Although this behaviour may not appear unduly worrying it can be problematic. There are pedestrians, for example, who may be knocked to the ground by whirlwind Dilly. As the behaviour continues year round, unchecked by weather conditions, there is the danger that Dylan could fall badly in icy weather (or wet autumn leaves). And there is the possibility that in Dylan’s 50-250 yard sprint (depending on where the minibus has managed to park) he will encounter something to spook him – a dog say – and throw him catastrophically off his stride and into passing traffic. For in this brief time, Dylan is beyond any supervision or control; all a carer can do is stand back and watch, fingers crossed. While the home sprint may be relatively low-risk, I worked with Dylan’s teachers and escorts periodically to try and re-shape the behaviour. We tried rebus symbols, rewards and changes to the drop-off routine but nothing made a difference. Eventually I gave up, thinking that perhaps once Dylan left school it would no longer be an issue, especially as the behaviour seemed to apply only to local authority transport (Dylan walks perfectly calmly into the house from cars and public transport). The behaviour appears, however, to be deeply embedded; Dylan has continued to sprint into the house from the minibus which now brings him home from his adult day centre. 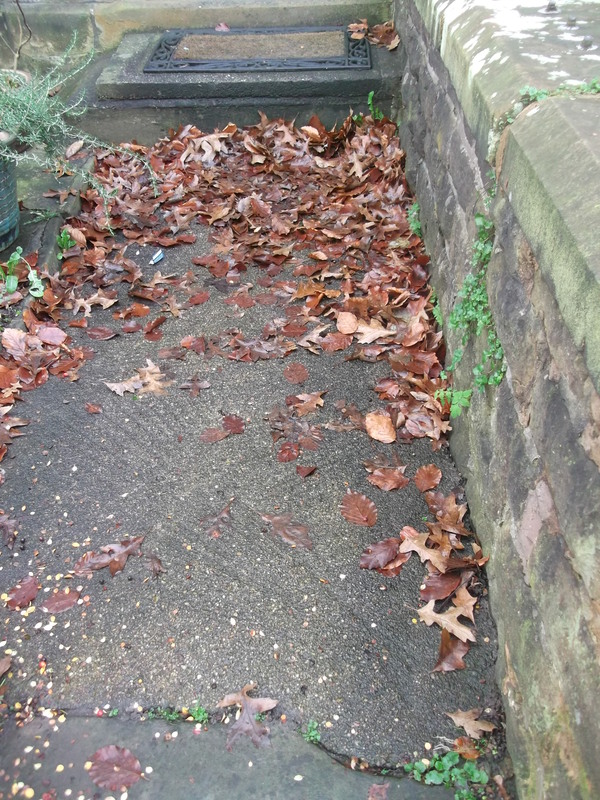 I must sweep these leaves up, I said to Dylan as I locked the front door of the house one morning last week: I’ll do it tonight. I put Dylan on his minibus and raced to work. I am always rushing to and from work. I have perfected the art of being back in time for Dylan’s bus while wringing every last minute from the working day; I know the shortest time it takes from desk to front door and I almost always bank on it. It’s a vital calculation; get it wrong and the consequences are horrible. Dylan would not understand, if I wasn’t home, why he couldn’t get off the minibus. Having to wait for me to arrive would not only distress Dylan but would have knock-on effects on other service users and families. When Dylan was at school I was aware that local authority transport was only allowed to wait for an absent parent for so long before taking the uncollected child to what I always thought of as ‘the pound’. While I never had had to retrieve Dylan from such a place, I did slip up a few times. Usually I was stuck in traffic within striking distance of home; over a 15 year period, given that I’m a single working parent, that’s not bad. I always cut it fine though and one thing my calculations never seem to adjust for is the sweeping of paths: I didn’t, of course, get home in time to do this last week. So when I got Dylan off the bus that night I hollered slow down, you’ll slip as he raced towards the house. The bus had had to park further away than usual that night due to workmen; as I had walked up the road to get Dylan I told them they might want to stand back a bit as in a moment my big boy would come tearing past at high speed – which is exactly what happened, with me in hot pursuit. I don’t know what I expected to gain by chasing after Dylan like that. He is nearly 21 and in his physical prime. I wasn’t going to catch him. Even if I kept him within ear shot he wasn’t going to listen to my exhortation to walk. So haring after him, I now realise, was pointless and silly. But that is what I did and yes, you’ve guessed: I fell on the unswept path. And I went with such a bang and a crack on those wet leaves I lay dazed on the ground wondering what on earth I had done and what I would do next. When I limped into the house Dylan had his arms clamped around his ears, a sign that he was distressed. So instead of letting myself cry or peel off my clothes to inspect the damage I said ‘mummy fell’ then maintained our usual routine of reading and signing Dylan’s link file entry about his day. I would deal with the blood and bruises later. Happily they turned out not to be so bad; a few days later and I am already mending. 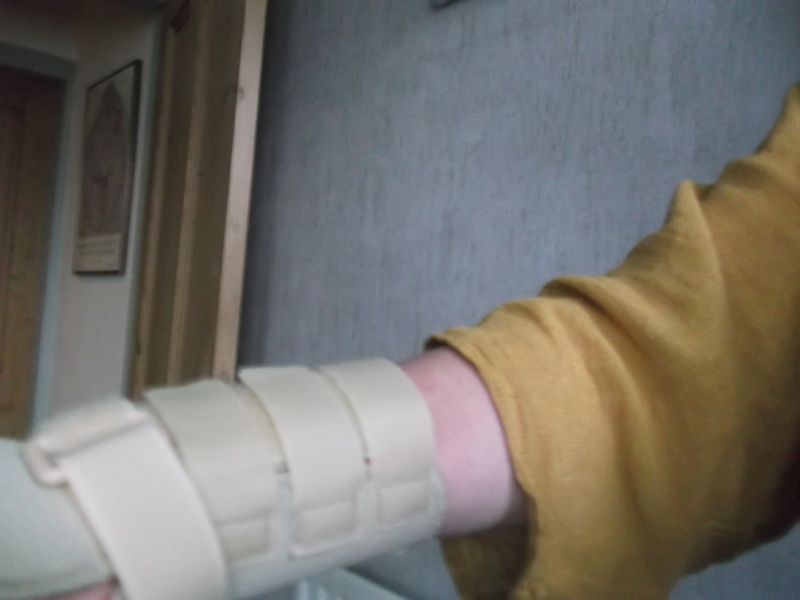 I could have done without that fall though; it has made caring for Dylan and myself, as well as working and doing things like driving, slow and difficult. 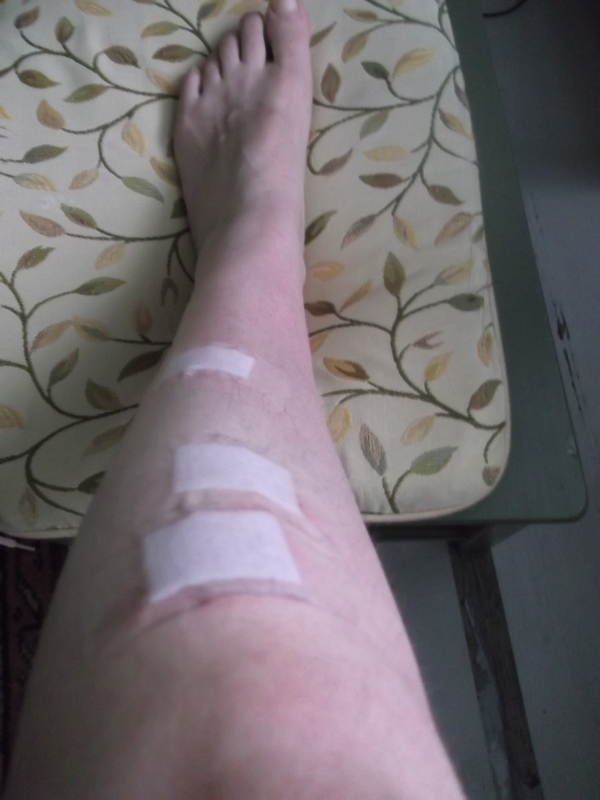 The first night, struggling to cook, shave Dylan or type, I chided myself for not keeping a swept path. I need a more zen approach to caring, I told myself; taking a few moments for small tasks, like clearing leaves, could make a difference to my well-being. So the next day I swept my path. It only took ten minutes but from that short time I took something valuable. 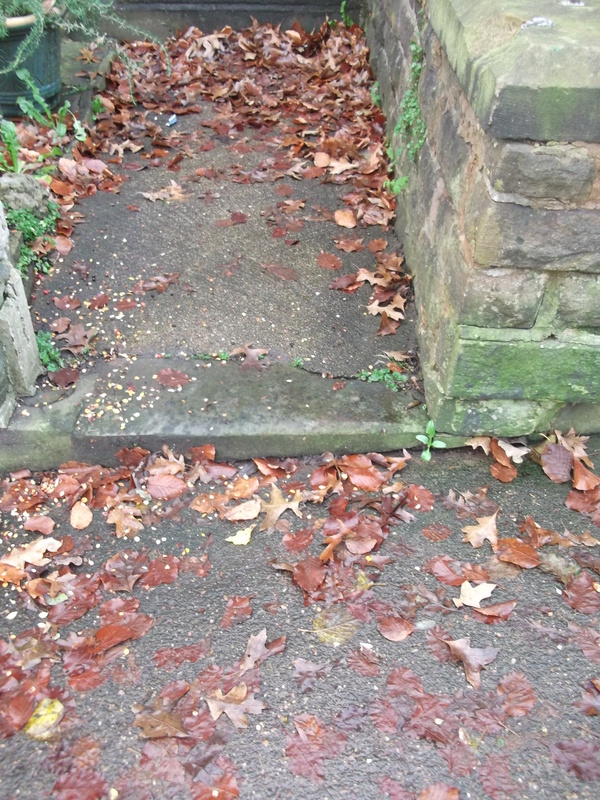 And while I was sweeping I remembered a poem about a swept path. The poem, by Helen Farish, is not about autism; the narrator is learning to care for lavender, rather than for a child. The process Farish describes, however, and its impact on her sense of self, resonates with my experience in many ways. 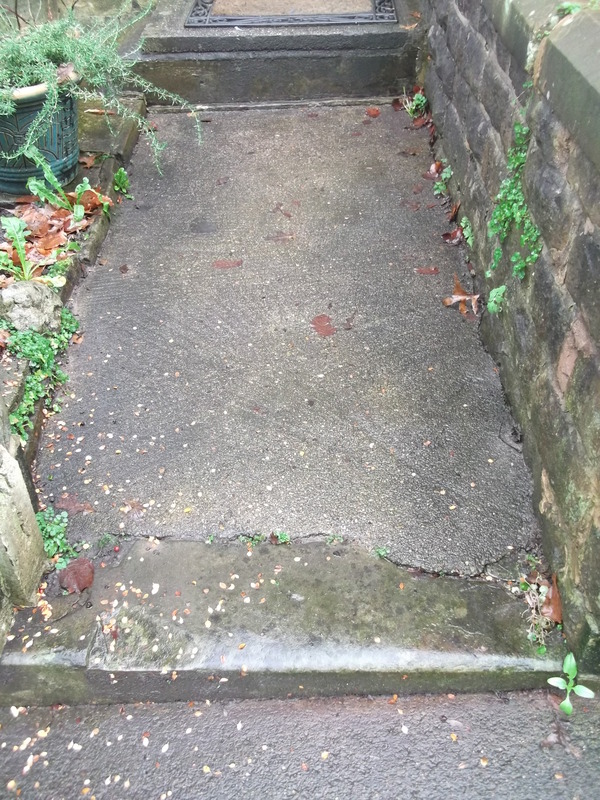 Farish reminds me to celebrate myself; this week the achievement I am most proud of is, indeed, my swept front path. the one she’s most proud of. In a previous post I reflected on the way we keep some poems as talismans, pinned to walls and notice boards. This week I found a charm poem taped into one of my old notebooks. The poem is by Federico García Lorca, a writer who has been important to me in recent years. I didn’t always care for poetry in translation; sound is as integral to a poem as meaning and I wanted poetry in its first language. But then, four years ago, a Lorca translation saved me. I was in deep grief; not over Dylan, this time, but my daughter from whom I had been suddenly separated. One of the ways in which it affected me was that I found myself unable to write. I had written poetry all my life; hard times had not previously silenced me. ‘The blood jet’, as Sylvia Plath wrote: ‘ is poetry/there is no stopping it.’ And yet suddenly I couldn’t make a sound. Nothing made sense to me. I was inhabiting a world of confusion and doubt; finding the words from or about the place seemed impossible. A poet friend, gently concerned, gave me a copy of Robert Lowell’s Imitations for Christmas that year. I might find reading poetry in translation helpful, he suggested, as it would engage my heart and mind differently. Soon after, he called round again, this time with a Lorca poem in the original and translation. My friend was taking a Master’s course in poetry and one of the exercises he had been set was to produce a version of the piece. Why didn’t I have a go too? If I could experience the poem without thinking too much about what it communicated then I might find I could catch its rhythm; perhaps the spirit of the language could restore me to sound. Lejana y sola. / Far off and solitary. y aceitunas en mi alforja. / and olives in my pack. yo nunca llegaré a Córdoba. / I will never get to Córdoba. jaca negra, luna roja. / a black horse, a red moon. desde las torres de Córdoba. / from the towers of Córdoba. ¡Ay que camino tan largo! / Oh what a long road! ¡Ay mi jaca valerosa! / Oh, my brave horse! antes de llegar a Córdoba! / before getting to Córdoba! That Christmas I read Lorca’s Horseman. Its melancholic rhythms and pace appealed but it was the moon which caught me. I remembered my Grandmother telling me to look up at the moon when I was away from home and remember she’d be looking too. I knew my daughter had, in turn, heard this from her Grandmother. Perhaps this moon, passed down the spindle side, was my song. *Grain (August), Fruit (September) and Falling Leaves (October) were Anglo Saxon names for the moon. My version of the Lorca poem wandered so far from the original that I didn’t feel the need to provide an epigraph ‘After Lorca’. I can feel the DNA of the poem, though, in its structure (2, 4, 4, 4, 2), imagery and voice. And so Lorca saved me: the poem was my breakthrough back to sound. Later, fall (my gone daughter) would win a prize in the Ilkley Poetry Competition. By then my daughter had returned; one of my happiest memories is of her being in the audience for the prize-giving. And because Lorca had saved me, my prejudice against translation faded. So when I encountered The Little Mute Boy one day I paid attention. The English version, translated by the American poet WS Merwin, delivered an instant strike to my heart. I was, as with De La Mare’s Sea Boy, transported into Dylan’s world. What is it about the poem which works such magic on me? Mostly I think it is the way it makes me re-think the meaning of ‘voice’. Here, the voice becomes something which is concrete rather than an abstract concept. I like this transformation of sound into object; rather than feel frustrated by Dylan’s silence I can visualise it as a ring on his finger. But such things can be lost, given away, stolen or bartered with. The idea of bartering with a voice reminds me of Ariel in The Little Mermaid who trades her voice for legs. In Lorca’s poem, however, a voice can be desired not in order to be used (‘for speaking with’) but simply to be worn as adornment or to be magically transformed into something else (a cricket for example). 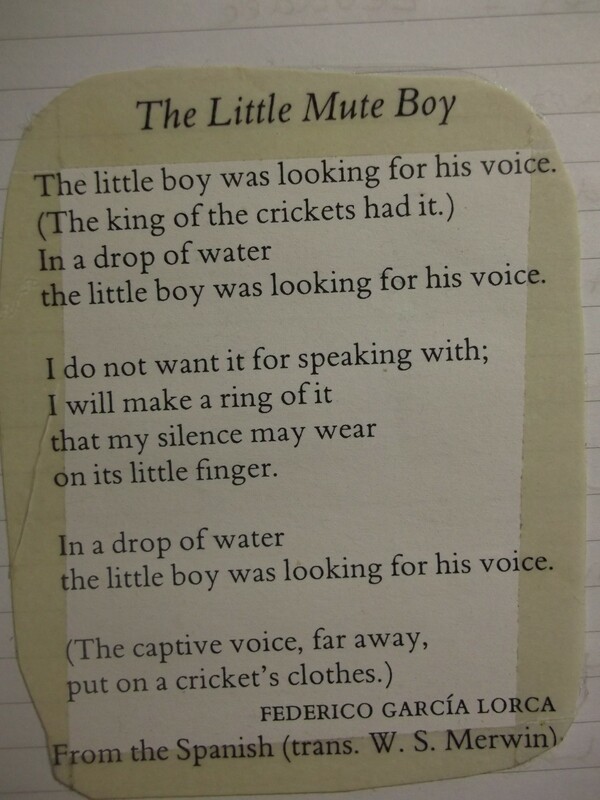 Not only does the ‘captive voice’ in the poem ‘put on cricket’s clothes’, it becomes king of the crickets. Crickets, of course, are famed for their night song; the stolen voice thus becomes more beautiful and magical than in the throat of a human. Because Dylan is so utterly absorbed by Pinocchio, the cricket in the poem also puts me in mind of Jiminy Cricket, the puppet boy’s conscience. The Lorca poem offers such comforts: from Dylan’s silence I can make crickets sing and golden rings. Once I’d appreciated translation it opened up new vistas especially as my daughter (with whom contact was re-established) had developed a passion for languages. The paradox of my children was not lost on me; one who didn’t speak and the other fluent in three languages. That summer I sent my daughter poems by Jacques Prévert, Pablo Neruda and Paul Verlaine. One weekend I received a rare phone call from my ex-husband, the tension in his voice palpable. Our daughter would not be able to catch the train that day to visit as planned; she had to stay and put something right. 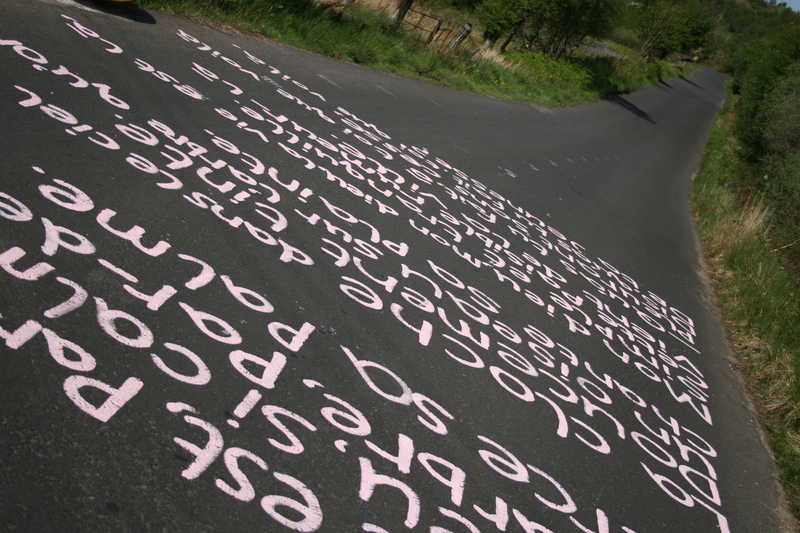 She had, it transpired, taken paint from her father’s shed and decorated a road. The road in question may be narrow and surrounded by lochs and mountains but it leads to somewhere not nowhere; in fact it is the only way into the community where my daughter was living. Everyone in the village had to travel that road, sometimes twice or more a day. The Verlaine poem (in pink) was not something you could ignore. Later, I would discuss the difference between public art and graffiti with my daughter; her lettering was impeccable and the poem beautiful, but what gave her the authority to decide what should be written on a public highway? 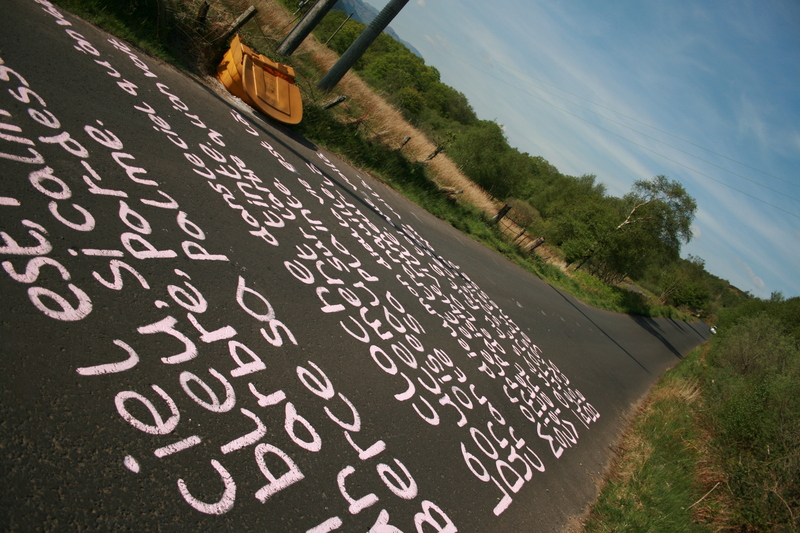 What if someone painted an offensive poem on the road – about autistic people for example? Painting the poem, my daughter countered, was the most powerful act of community she had engaged in. As a result, she had got to know neighbours and people she had not previously spoken to. Out of her act came friendships and respect. No one in the village had expressed anything but support for her. Even so, her father was concerned that he would be liable for street cleaning if anyone complained; it was, technically, defacement of public property. So my daughter wasn’t able to take the train that day because she had to paint it out with bitumen. 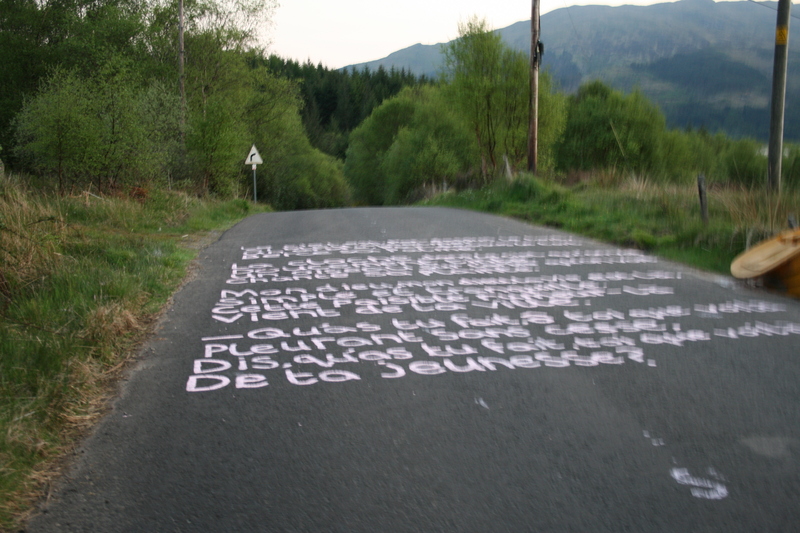 When my daughter painted the poem in the road I’d asked her whether she planned to leaflet the community with a translation: mais non, she’d replied. Soon after, my daughter returned to live with us. Sometimes I’d catch her muttering at me in words I didn’t understand: speak English please, I’d say. Perhaps my children weren’t such a paradox after all; I needed as much skill to translate my daughter’s speech as Dylan’s silence. If poems are powerful because they help us see the world with fresh eyes, poetry in translation makes us look twice; it can take a second language, sometimes, to understand a mother tongue. Le Ciel Est, Par-dessus le Toit is a talisman for my daughter as The Little Mute Boy and The Sea Boy are for me. 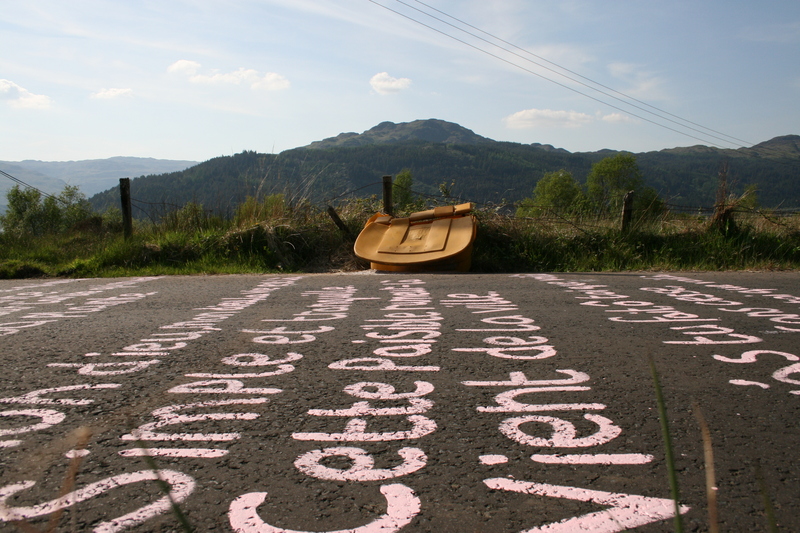 The influence of these poems endures: on a Scottish road, I’m told, pink paint is showing through bitumen. I like to think that, nearby, the king of the crickets is singing. Road art, and photographs of the road art, are by my daughter. Ways Of Drowning: water, autism, the sea etc. 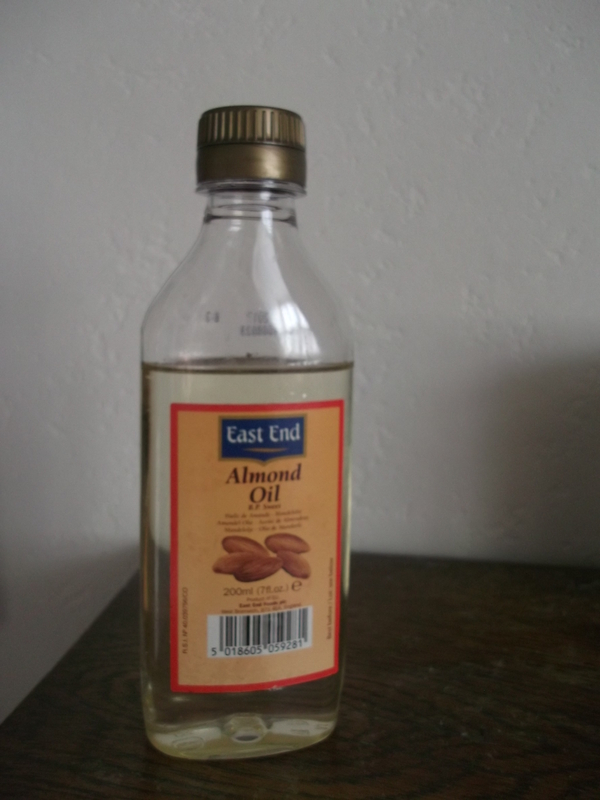 A small bottle of almond oil caught my eye in the Asian foods section of the supermarket last week. I lingered over it, pulled by two memories. The first was of a boyfriend’s sister telling me that she soaked her hair in almond oil overnight. The second was of a midwife at the hospital where Dylan was born asking my mum to bring almond oil with her next time she visited. Shops did not routinely stock nut oils in the early 90s so I was impressed when mum turned up with a bottle the next day. The midwife showed us how to massage the baby with the oil. He had been born with skin flaking like tissue paper from his body. It was sometimes a sign of post-maturity, the midwife said. Was he an overdue baby? But Dylan had appeared more or less on cue, his birth only slightly delayed as if (I reflected later) to coincide with a high tide and full moon. His skin was a mystery. Mum and I rubbed the oil into the tiny soles of his feet and the palms of his hands with our finger tips. It’s nice for baby to be massaged, a passing midwife commented: he’ll like that. 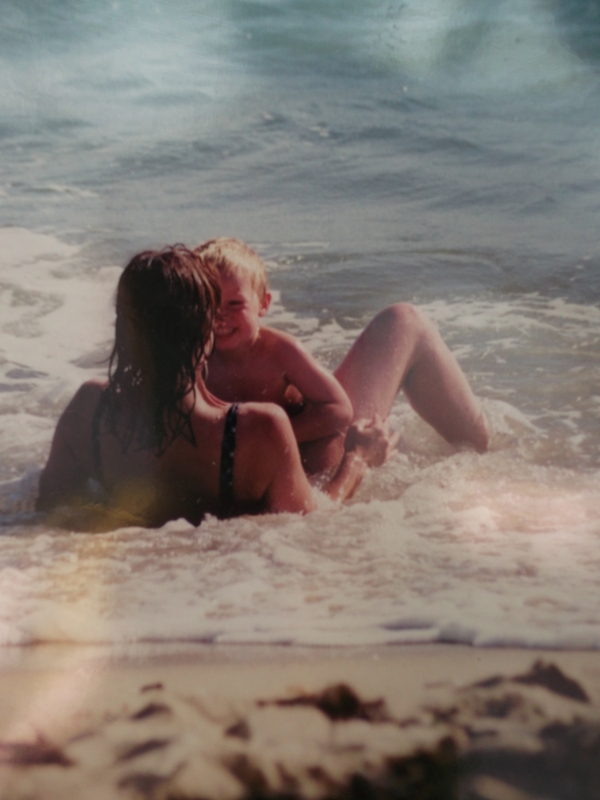 When Dylan was diagnosed autistic, one of the things I fastened on in my search for cause was his difficult birth. I have written elsewhere about my long labour and the way Dylan’s head was born but then withdrew. Later I would read in African folk lore that magical spirits can obstruct a birth. I would also recall that it is magical, in English folk lore, for a baby to be born in its caul. My brother’s had been intact at birth and Dylan’s might have been had a midwife not broken my waters. My poem Ways of Drowning opens with these births. 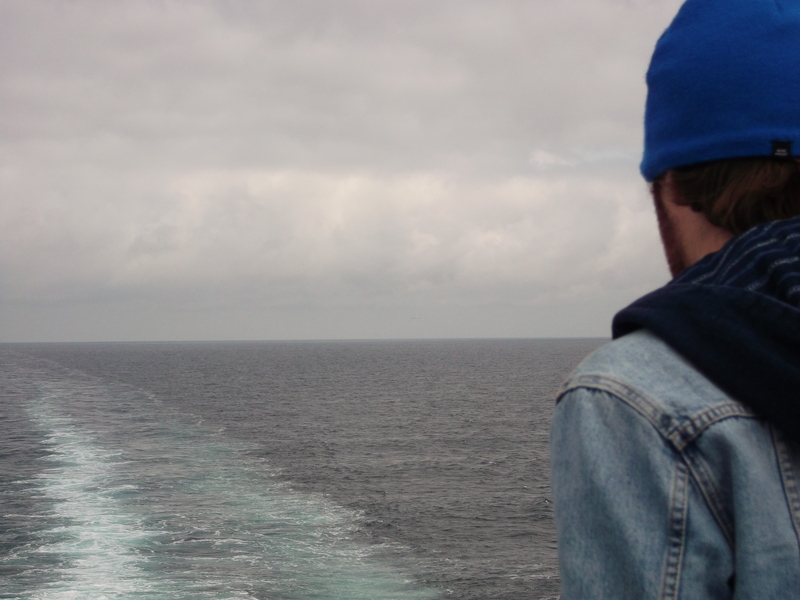 at sea – he’s one in a million, love, born in a shroud. cannot relax in the bath. between the ebbing contract of my womb – tore the sac. in search of underwater – wait for me to falter, let him slip. 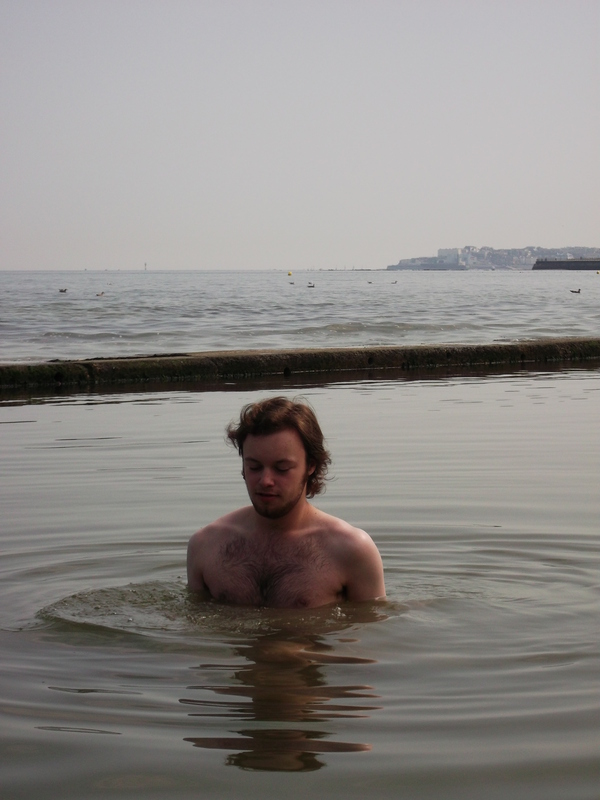 The first stanza of my poem ponders a darker side to the caul’s charm; as the protection is specifically against drowning at sea, I imagine my brother reluctant to enter water where he isn’t protected (a lake, say, or bath). 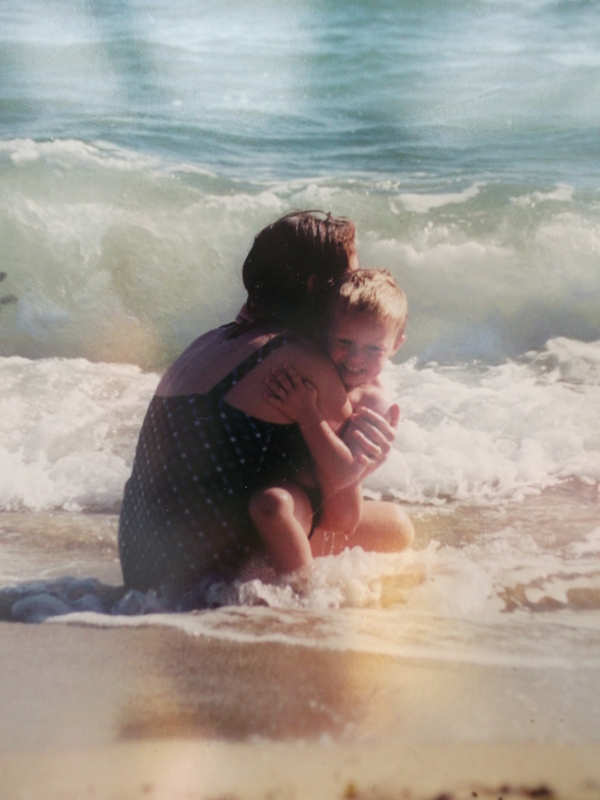 A suggestion implicit in the second stanza is that by breaking my son’s caul, I not only destroyed the protection he might have had, but made him vulnerable: my baby’s arrival with flaking feet signalled an affinity for water, his desire to be under it. 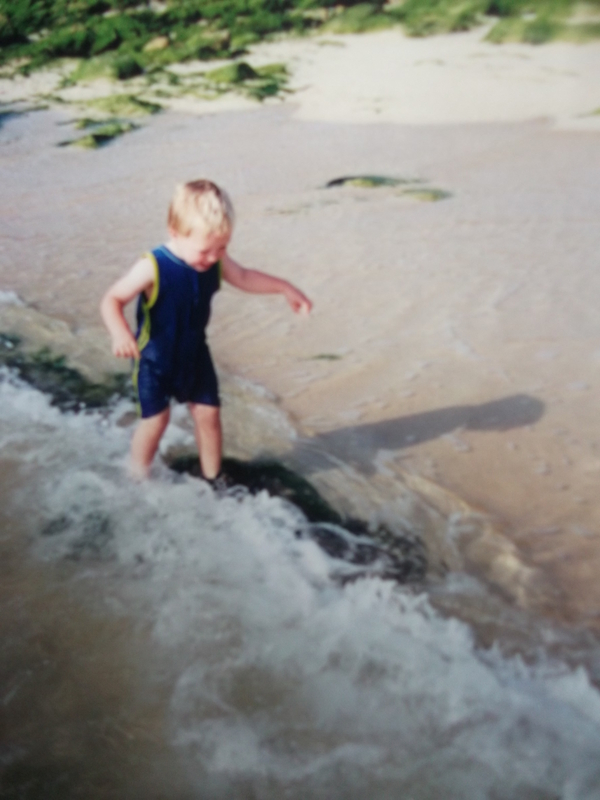 Only after I had named my baby did I realise that I’d called him for the sea. 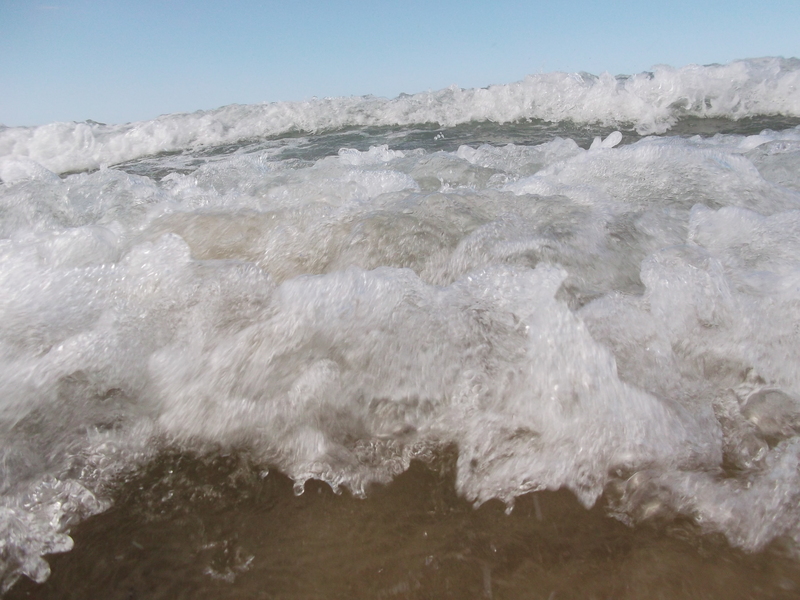 I had intended it as an homage to Dylan Thomas and Bob Dylan, not the waves. Still, as Dylan had been born in a seaside town it felt appropriate; I’d held him to the high window so the first thing he saw, after me, was the sea. The serendipity of Dylan’s name soon became apparent. Before I noticed the symptoms of autism I’d puzzled at the pull of water; not only was Dylan soothed by it, he could sense its presence. I describe this in my poem Into The Blue. to silent springs bubbling from underground. searches through his picture books for lakes and lochs. The poem goes on to describe my urge, in sea, to ‘loose my grip, let him go’ believing that he ‘would skim easily/across the water’. I use the image of a butterfly to suggest transformation; in imagining such a re-birthing, I make the sea more of a mother to Dylan than me. It wasn’t only Dylan’s first name that turned out to be appropriate; years later, on hearing Dylan’s full name, a child would ask why I had called him after a girl. But I haven’t, I replied, confused. Ariel, the child told me, was the name of the little mermaid: she was a girl. I had intended Dylan’s middle name to refer to Shakespeare’s The Tempest and to Sylvia Plath, not a Disney film. For years I fielded questions wearily. No, Dylan’s name was not because of The Little Mermaid: I had never seen the film and knew nothing about it. And actually (by the way) Ariel was a male name. 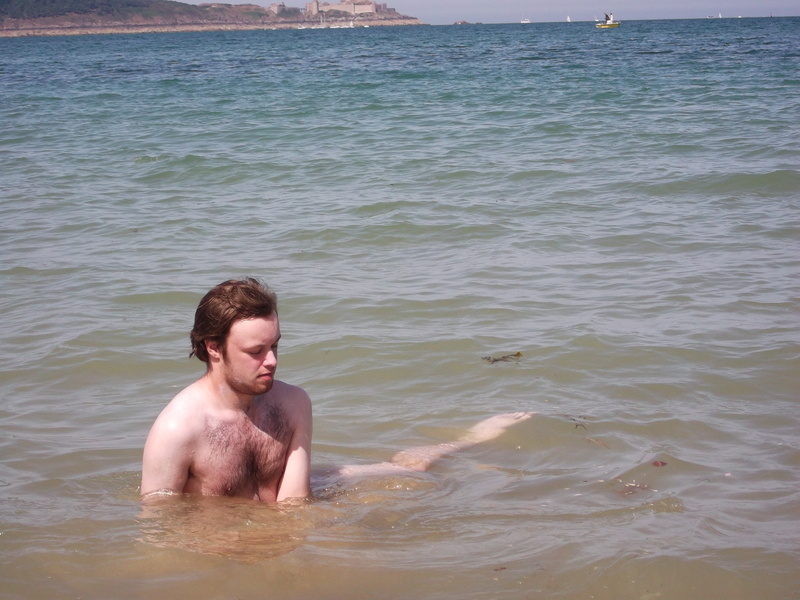 But then out of the blue, on the run-up to Dylan’s 20th birthday, he developed an interest in The Little Mermaid. A year later, Ariel the mermaid is Dylan’s heart’s delight. I have written elsewhere about the impact of film on Dylan. While Disney has been the trigger for some positive learning, Dylan’s love of Disney also has its challenges. Given his passion for the sea, for example, Dylan likes to copy the underwater sequences. I can understand why he would do this; the action tends to be exciting and lead to narrative transformation. Unfortunately, however, Dylan’s attempt to copy the underwater antics of his favourite characters is potentially disastrous. As a non-swimmer Dylan is at high risk in water. Lacking awareness of its dangers, he has been known to leap into pools and wade out to sea. Dylan would, I am convinced, simply keep walking into the ocean. I have had to yank him up from the bottom of the bath and from swimming pools repeatedly. After an incident when Dylan had to be rescued from the deep end of a pool where he had leapt, fully-clothed, after a lesson, staff at Dylan’s school decided they were no longer able to take him swimming. Supervising Dylan at the edge of water – beaches, harbours, river banks – makes me nervous. That torn caul could not possibly be the cause of Dylan’s vulnerability in water. Still, I think about it sometimes. It’s strange that I prefigured the way Dylan would ‘spend his life/in search of underwater’ in a poem written years before. This, of course, makes me even more nervous. Years ago a Medium told me I should always live by water. The simplicity of it appeals; that I am the best I can be by water. There is some truth in it I think. I have always been a swimmer. Walking by water soothes me. I am in awe of the sea. Perhaps that is what distinguishes my simple love of the sea from Dylan’s more elemental need. 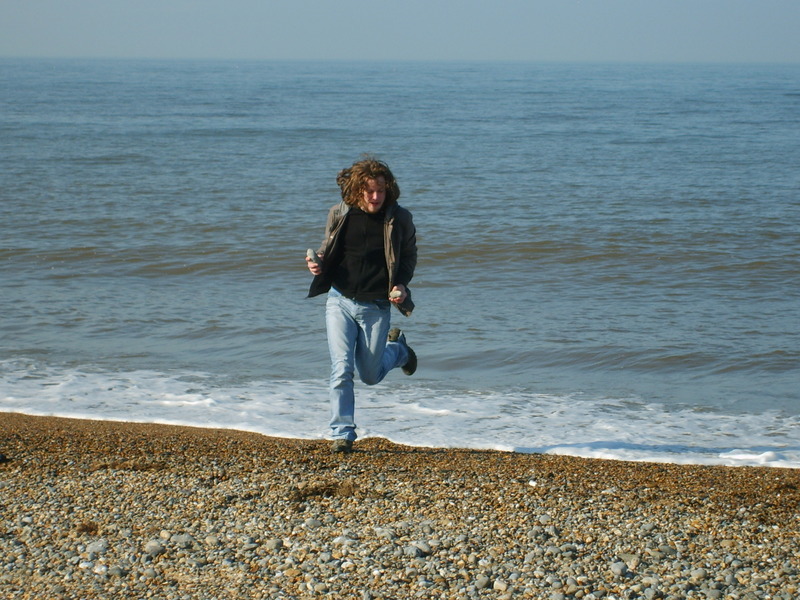 Dylan isn’t in awe of the sea: he wades in as if it is home. I am the sea, I am the sea! It is the sense of exile strikes me; being away from the sea is represented, in literature, as estrangement from self. This idea is in The Little Mermaid as well as the great sea poems like Coleridge’s Ancient Mariner and Masefield’s Sea-Fever. 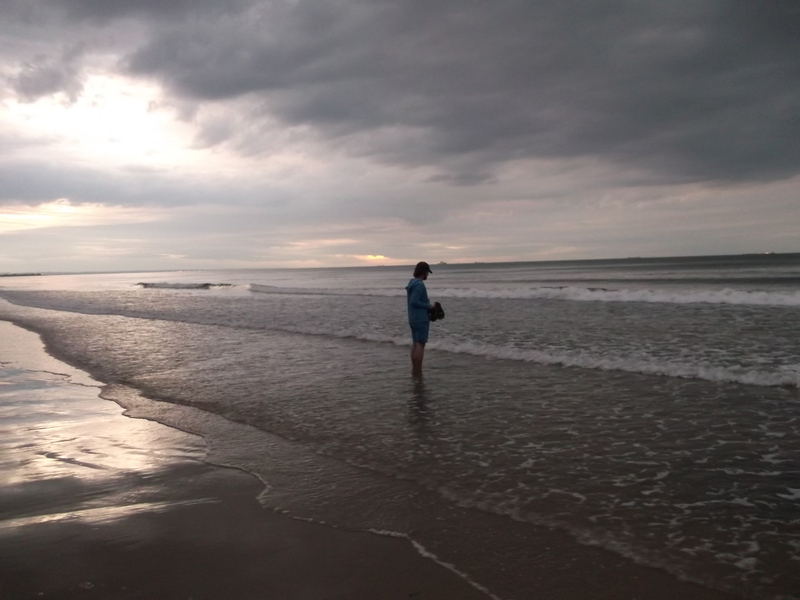 Could Dylan’s identity as a human being – his sense of self – depend on his relationship with the sea not people? ‘One of poetry’s jobs’, Ruth Padel writes, ‘is to transform real life imaginatively so we understand our lives more pointedly, more fully.’ (Padel, p.18). It is in the close observation of a poem that we feel the thrill of the familiar made strange and the strange, familiar. Poetry helps us to recognise ourselves but with fresh eyes; such recasting of experience changes the way we think and feel about our lives. Some of the poems which influence us this way, Neil Astley notes, are encountered by accident: ‘That short poem we stared at, read and re-read, on the underground or subway train. Or the one photocopied by a friend, now a personal talisman pinned to the kitchen noticeboard or kept in a wallet’ (Astley, p. 19). Last week I re-encountered a poem which, years ago, I pinned to a noticeboard. The bubbles and froth of the sea. It isn’t one of De La Mare’s more renowned pieces and reading it today there are things about it I don’t care for. But at a time when I was struggling to come to terms with Dylan’s diagnosis the poem helped me. What it did was offer me an affirming mirror; the boy in the poem, I realised, was like Dylan. Was he autistic? I remember asking myself. I wasn’t sure I’d encountered such a representation of autism in literature before. I kept the poem on my noticeboard for years. I found Peter both strange and familiar; while I recognised Dylan in him, it made me rethink what I knew. Peter and Dylan, I realised, were sea boys; they had an essential connection to the sea. For me, I think, this was part of the process of seeing Dylan for who he was instead of who I’d expected him to be. Except for the pictures of me with Dylan (which were taken by my ex), the photographs were taken by me in Brittany, Pembrokeshire, Saltburn, Norfolk, Kent and the English Channel between 1996 and 2013. Living with an adult who doesn’t use speech to communicate means that I spend a lot of time thinking about language. 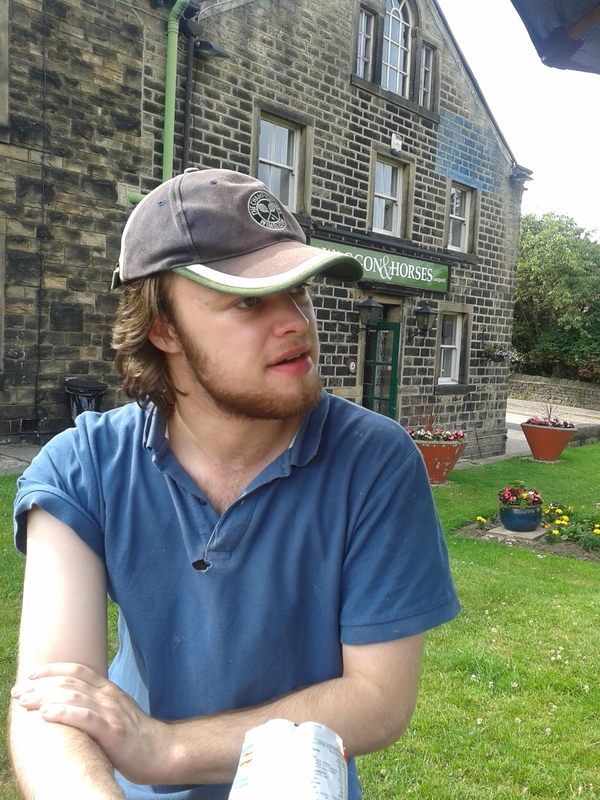 People often remark on the irony of a poet having a ‘non-verbal’ son but I have come to realise there are more connections between Dylan and myself than differences, not least in our approach to language. How can that be when words are a writer’s currency and Dylan has so few? Poets, it seems to me, are as interested in the way that words fail as in the way they work. When poets write it is from a place of agony. Language is inadequate. We make faltering choices and wrong turns. We cannot find the exact description for the light outside a window. We fail to find a way of distinguishing one feeling from another. Constantly we delete, discard, begin again. Our quest is for the ‘best words in their best order’ (Coleridge, 1827). No word should be wanted or wasted. 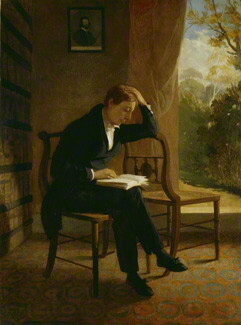 We will work a piece over and over to find the ‘truth and beauty’ (Keats, 1820). Even then, some poets consider their entire oeuvre to be no more than work in progress. This difficult search for the right word is a process which my son also knows. Poets vary in the time they spend writing but I cannot engage in it for more than a few hours. I find the experience mentally and physically exhausting. If I think about the agony of writing it helps me to understand why Dylan may choose silence. Consider how it might feel if communication were like this all the time. What if it is so difficult for Dylan to find the right words that ordering breakfast is as challenging as writing a poem? Or if he experiences the world in so many colours the words to differentiate between them don’t exist? If Dylan can hear sound above and below 20KHZ, how might he begin to utter a word? If his senses are flooded with stimuli, as some autistic people report, then is Dylan’s silence so surprising? It can be safer, sometimes, to say nothing at all (a state poets refer to as writer’s block). Language is only a representation of the world; words are at least one step removed from the phenomena they describe. As I have argued elsewhere, Dylan may experience the world more intensely and essentially than those of us who live behind the language barrier. Dylan does, however, need some strategies for communication and much of my time is spent trying to help Dylan to develop these. At the moment Dylan’s favoured methods are visual. Photographs approximate the thing that they represent most closely and communication can be reliable this way. I might use this photograph, for example, to explain a trip to The Old Horns. However, the specificity of the photograph also limits its usefulness. I couldn’t use the same photo to communicate that at some point today we’ll stop for a pint somewhere because ‘somewhere’ is general and can’t be photographed. This reference to the general and the specific reminds me of three writers’ maxims, commonly used in creative writing workshops:. I know writers who get quite agitated about these maxims, arguing that poetry cannot be reduced to rules. I am aware that there are plenty of fine poems which break these rules. Subversive practice is, I know, often at the heart of the startlingly original. 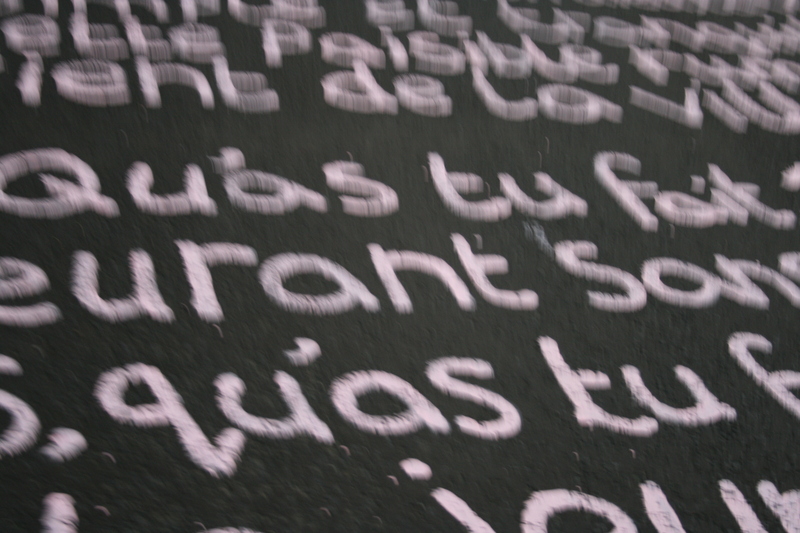 However as a starting point for writing poetry the maxims are not a bad framework to inform our choices about language. I would, for example, urge a beginning writer not to use abstract nouns such as poverty or anxiety but to focus on concrete images to communicate these: show the poverty in the way she walks, I might say, or: don’t tell us he is worried; show it in the dart of his eyes. I would ask the writer for particular rather than general information: not music, but Bach’s Overture in D; not the pub, but The Waggon and Horses. Precisely which pub is the sort of detail that is important to Dylan too; he is particular, not general. Dylan is concrete, not abstract. Dylan shows me things, he does not tell. Dylan, I would argue, intuitively adopts a writerly approach. 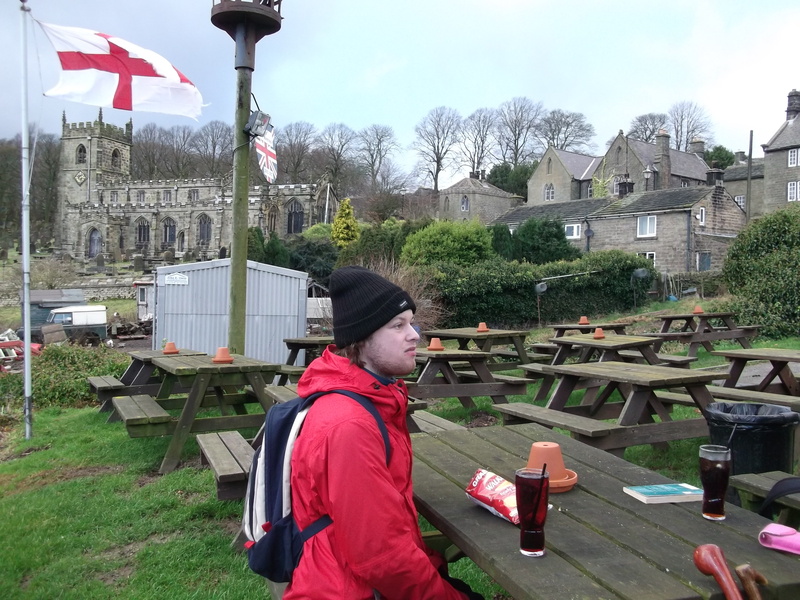 Dylan cannot, however, live wholly in the particularity; he needs ways of thinking about pubs in general and of understanding abstract concepts such as love and fear. As a writer I spend my time supporting students to make their writing concrete and particular; realising that my work with Dylan must travel in the opposite direction can feel quite challenging. Although Dylan hasn’t engaged with communication systems that have been offered to him in the past there have been recent indications that he may be more receptive. Dylan has moved, for example, from using only deictic gestures (pointing to request, declare or ‘share the world’) to copying my use of representational gestures such as mimicking drinking and driving (not at the same time of course). This is an important shift in that it signals Dylan’s developing awareness of communication and its uses (I have written about Dylan’s use of gesture here and about his use of speech here). Symbols and signs can offer a good staging post between the specificity of photographs and the abstractions of language. I used these with Dylan when he was younger but he wasn’t particularly responsive then. In due course my signing tailed off and, without regular practice, I forgot the signs I knew. I suspect that Dylan wasn’t ready for the introduction of symbolic language at the time, but his recent interest in representational gesture has encouraged me to try again. 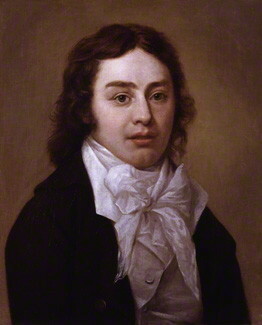 ‘An idea in the highest sense of that word’, Coleridge reminds us, ‘cannot be conveyed but by a symbol’ (Coleridge, 1817). Makaton is a language programme based on British Sign Language which combines signs with symbols and speech. 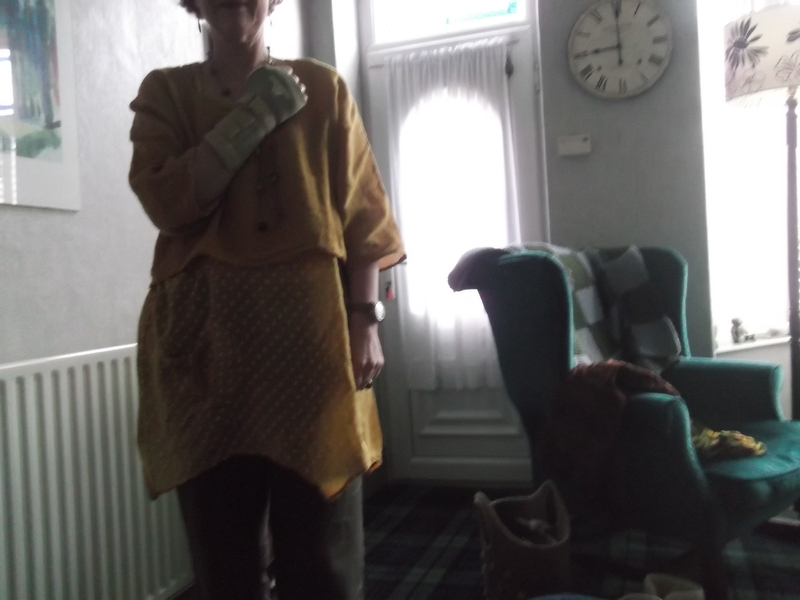 In a previous post I’ve referred to the tendency of parents of autistic children to use gesture and facial expression so makaton feels like a natural and comfortable development for me. I’m hopeful that signing might be the next step for Dylan’s development in that it includes abstract concepts but makes these concrete by representing them through hand and finger pictures. Practising signing recently I was reminded of one of my favourite movies, Stand and Deliver (1988). The film tells the true story of how a group of students at Garfield High, East Los Angeles, pass an AP Calculus test against the expectations of school and community, thanks to the dedication of their teacher Jaime Escalante. It is a wonderful movie which I’ve used for years with my students in order to explore key educational and social justice issues. It is also a marvellous source of examples of supporting the learning of students who aren’t used to succeeding and who lack confidence. Señor Escalante understands that his role is to give his students strategies for learning and that in Maths – like language, a subject of signs, symbols and abstraction – that means making learning concrete. One of the tricks Escalante offers his students is a method for calculating their Times Tables on their fingers; come on Fingerman, he says to one of his students who is hesitating to solve a problem: you can do it Fingerman. I’ve been feeling a bit like Fingerman as I try to build signing into my everyday language practice. It’s early days yet but Dylan seems to enjoy watching me. Even if he doesn’t always attach meaning to the signs, I get the sense that he finds them pleasing aesthetically. This week I was signing the comment in Dylan’s link file, reading back what the care staff had reported about his day. As I signed, Dylan watched me intently, copying back my gestures. I was conscious of the dance of our hands through the air, drawing shapes and objects, describing actions and feelings. There was, I thought, a truth and beauty to our hands; they were searching for the best words in their best order.